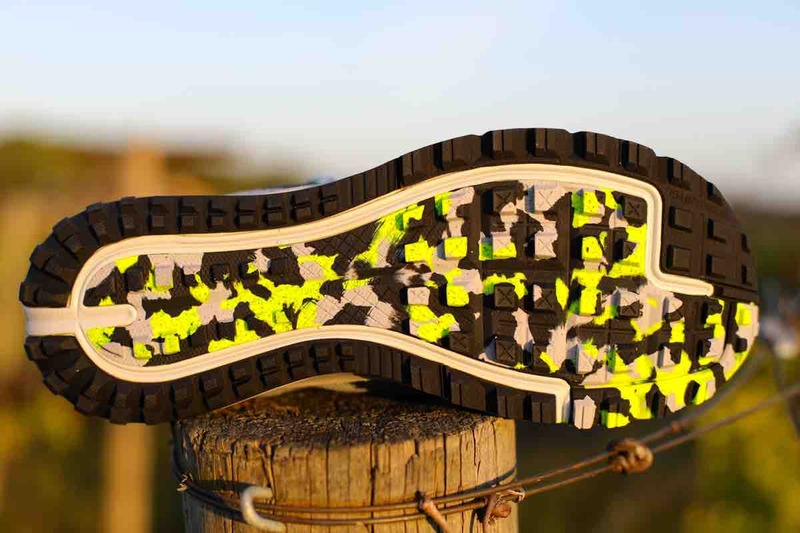 The Nike Air Zoom Wildhorse 4 outsole. The Terra Kiger has always been a simpler animal than the Wildhorse, which changed from a lighter-weight and flexible trail shoe to a more robust shoe capable of handling 100 miles. The Kiger has always aimed at fulfilling the 50k- to 50-mile realm, and it works best on non-technical trails due to the lack of rock plate. Nike really dials in the upper here, using lighter-weight and more breathable mesh throughout the upper, which is underlined by a high-abrasion nano-skin layer aimed at keeping debris out of the forefoot and heel of the shoe. This technology works great without making the foot overheat, and to my knowledge it is the first technology of its kind. 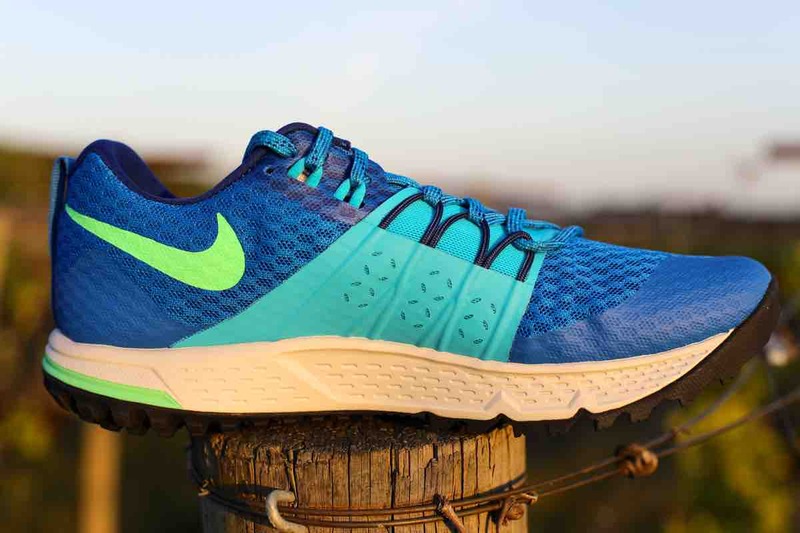 The Nike Air Zoom Terra Kiger 4 ($125) retains the same overall forefoot width of its predecessor, which is plenty wide to accommodate most runners despite not coming in widths. Nike gets rid of the previously used Flywire technology in favor of a gusseted tongue and a more hugging midfoot fit. Overall, the Kiger 4 has the feel of a road shoe such as the Nike LunarTempo, with a stretchy and locked-in upper, while still featuring a great trail midsole and outsole. 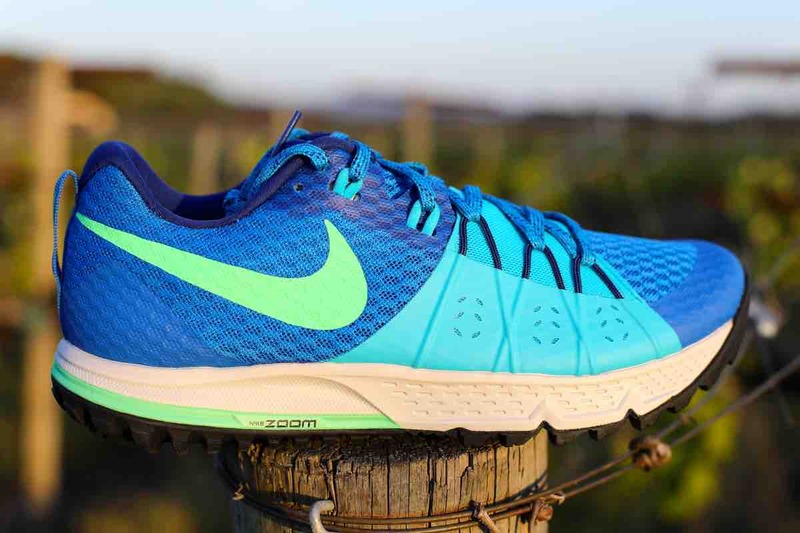 The Nike Air Zoom Terra Kiger 4 lateral upper. Nike continues to employ the same effective waffle sole pattern used on the Wildhorse 4. I think this outsole pattern works great unless you’re faced with thick mud and clay. The Tiger 4 also keeps the same “clownpuke” rubber, which is both cool looking and environmentally friendly due to its recycled nature. I can also feel the rounded heel in the Terra Kiger 4, which seems to roll with the ground and contributes to faster and almost minimalist-type running. The Nike Air Zoom Terra Kiger 4 medial upper. The midsole is the same as it’s ever been, using two Zoom Air pods buffered by Phylon Midsole material. The result is firm but forgiving, and the Terra Kiger has always been favored by forefoot runners. 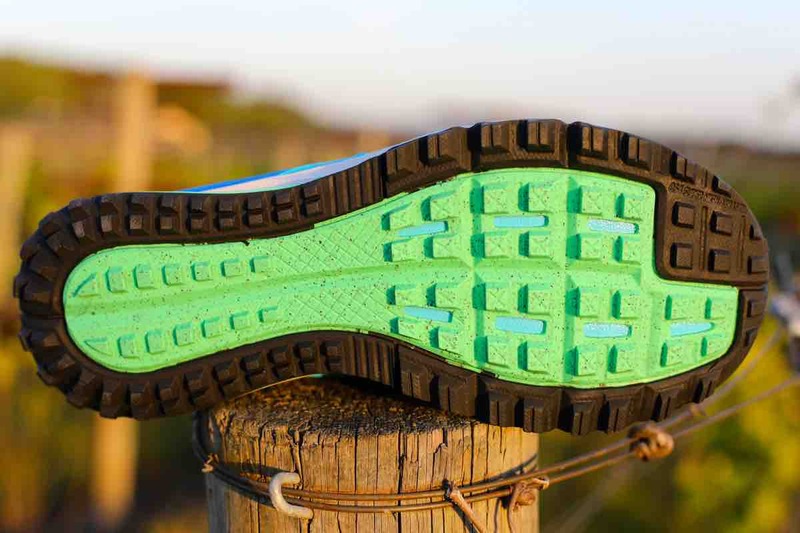 With a lower 4mm drop the overall stack height of the Kiger 4 is 24mm in the heel to 20mm in the forefoot, and certainly has enough protection for most runners throughout a 50k- to 50-mile race. 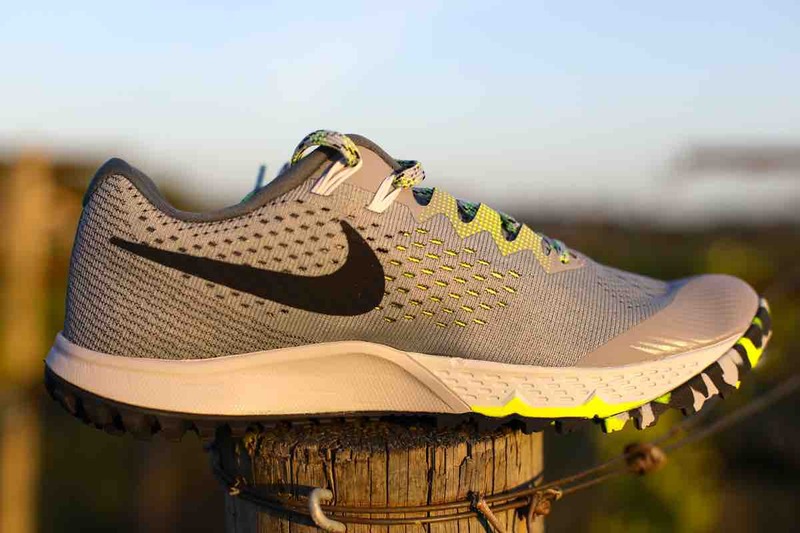 The Nike Air Zoom Terra Kiger 4 outsole. Nike has created two classic trail shoes that I feel every runner should at least try on. Both shoes have a nimble feel and every version gets better than the last. It is hard to argue against the Wildhorse being the best value for price per mile on the market. Meanwhile, the Terra Kiger continues to have a great, go-fast, cushioning-to-weight ratio that makes it a joy to run in. The durability of the Wildhorse 4 is certainly something to experience, and if you’re a miser or a runner on a budget looking for a shoe that can do it all, look no further. If the Wildhorse 4 seems like too much shoe for you at 10.7 ounces, the Kiger 4 has the same feel with added flexibility and softer forefoot cushioning. In an era where Nike posts quarterly fiscal gains between seven to 10%, it is puzzling why they would choose to continue to only make the same two trail running models. 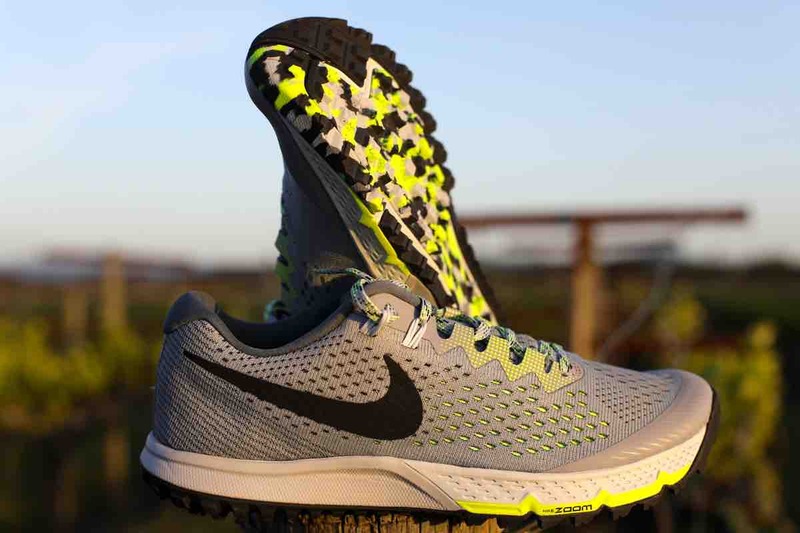 While their road-shoe catalog boasts around 13 different models (give or take), trail running has remained a very low priority for Nike despite boasting arguably the most competitive trail running team around from 2014 to 2016. Hopefully this will change in the future and we can see a larger and more versatile product line. 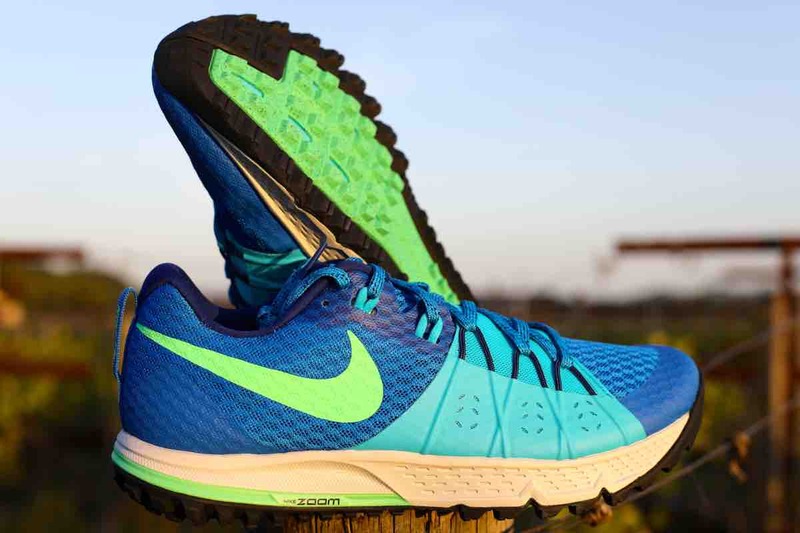 Do you run in the Nike Air Zoom Wildhorse or Terra Kiger? What features of these shoes do you particularly enjoy? Have you gotten your hands on a pair of Wildhorse 4s or Terra Kiger 4s yet? If so, what are your thoughts on the updates to the models? I have been running in Terra Kiger 3’s for a while now and am both excited and a little apprehensive about the Terra Kiger 4’s. Excited because, well, new shoe. Apprehensive because a couple of the changes – the tongue, the flywire, the upper – might have an impact on how they feel…and then I’ll be scouring the internet for TK 3’s in my size instead of embracing the exciting new! It’s good to read that the upper seems to be pretty fantastic, and that the fit across the front is the same, too. I guess I’ll have to wait to see how the fit with the new tongue and sans flywire is, but I’ve still got a couple of pairs of TK 3’s in boxes that will get me through before I find out for myself. The TK 3’s are a great shoe and I’ve worn them out past 100K distance without issues. I hope the TK 4’s will continue in the same vein. I think you will be pleasantly surprised with the upper. I am very pleased with the upper on the TK4. While I liked the concept of the burrito tongue on the earlier version, I could never get a nice fit with it combined with the flywire. New upper is much better for me. Less heel slop and can cinch down if needed without pinching at the top. Some have said ride is softer than earlier versions, but I can’t tell. I absolutely agree with you. While I didn’t mind the burrito tongue, this TK4 upper just fits better. I feel like I’m strapping on a racing shoe. I also can’t tell if the ride is softer as my TK3s are completely dead at this point. I feel like the Kiger 4s are a bit of a return back to their roots with more of a racing flat feel, especially the upper. They breathe great and work very well as a hybrid, road-to-trail shoe. Thanks for reviewing these. I’ve been running in my current pair of WH3 for over a 1000K, and I’m happy to confirm that they’re indestructible. They’re also as comfortable as they were on day one. I’ve been using them on any type of terrain from gnarly, rocky trails to roads. The only things I dislike about them are their bad grip on wet rocks, and the lack of ground feel on technical descents. Overall, I wish they gave a tad more feedback on technical terrain. Still, they’re my go-to shoe for any distance and any type of trail, and I’m happy to hear that Nike didn’t mess up the updated version too much. Love the WH3 but have one concern with v4 upper. Has anyone experienced the flywire lace loops getting snagged on rocks or fallen branches? They just look like the could get caught easily and ripped. I have only logged 30K with Wildhorse 4 on rock surfaces, but don’t think that durability of upper is going to be a problem. The Wildhorse 3 was my favorite trail shoe of 2016. It does everything well. The Kiger 3 was often my 50km race shoe of choice as well. It’s a solid, go-fast trail shoe. My only question – why do both the Wildhorse and the Kigers get heavier every year? The past two updates have seen both shoes increase in weight and I’d love for Nike to lean on all that design and manufacturing goodness they have at their disposal to keep the shoe the same weight or actually shed some weight to get back to the 8.X ounce range for the Kigers and 9.x range for the Wildhorse in a men’s size 9. Absolutely loved both of these shoes last year. Bought a second pair of WH3, not because my first ones were wearing down, but because I loved them that much. Almost no wear after 400+ miles on them. Have the TK3’s as well. The fit was great, but I ran into a problem that I have yet to see anyone else mention. On the first pair of TK3s I had the tread started peeling off in multiple spots. The first spot was on the back where the “clownpuke” rubber stopped. The second spot was on the medial side of the tread black tread met the “clownpuke”. It was so bad on my first pair I exchanged them. The second pair only started peeling on the medial side. As I said, I was shocked at how much I loved these shoes and will continue looking at these for the foreseeable future. If you haven’t already, and are skeptical of a Nike trail shoe, you need to take a look at these. Hi, Brian. I’ve seen several comments online of other Kiger 3 users who had the same problem with parts of the outsole peeling off. I think it’s a design flaw and not a matter of quality control. It’s common in other shoes with segmented outsoles (some Dynafit models, for instance). They could fix it by copying the outsole layout of the Wildhorse. I had the same problem with TK3 outsole and had them replaced. I also agree it’s a design flaw. This is by far the best and most informative review I’ve come across of the latest versions of both shoes. Thanks! I run in the Wildhorse 3 and I can’t praise them enough. I’m glad that version 4 doesn’t ruin a great shoe. I guess ground feel is a personal thing, but I get plenty of feedback underneath, while still being protected. And they are durable like nothing else. It may take a while until I get to try the new ones. I have a pair of Wildhorse 2’s. While I love that they feel like a real running shoe, the last thing I would call them is durable. Has Nike since improved the sole? The change from the Wildhorse 2 to 3s was quite dramatic, and this is really where the improved durability happened. The lugging is much more robust as is the upper. If you haven’t tried a WH3 I would encourage you to do so. The current Kiger 4 is more similar to the WH2 in my opinion. Thanks for the feedback, Tom. My only experience with Nike trail shoes was also the WH2 and I found the fit just fine, but the durability in the outsole some of the worst I’ve experienced. Maybe I’ll throw Nike a bone and give one of these updated models a shot. I’ve been running with the first Kiger and the 3rd ! I loved how sensitive were the ones, and how grip the 3rd. I had a pair of the WH 3’s that easily lasted 600 miles. The only reason I retired them to lawn mowing duty is that the lugs in the forefoot were about done. The rest of the shoe was like new. My only concern was that they made the bottom of my foot in front sore after about four hours of running from the rock plate. It felt like the plate was on top of the mid sole as opposed to on the bottom where it is. Perhaps sandwich it in the middle? I agree that the shoe is bomb proof. In my opinion, a “steal” at $110. Best value in any running shoe I have ever come across. I had this issue with the WH3s, of which I had two pair. It would come on runs longer than two hours, and I chalked it up to the fact that this is a semi-firm midsole. For whatever reason, I haven’t had this problem yet in the WH4. Could it be the new asymmetrical lacing not placing as much pressure on the metatarsal heads in addition to the deeper toebox? I’m not sure. But, I like this shoe better. Is the forefoot still as shallow as in the TK3’s? TK3 had to much pressure on my forefoot and big toe. Great question. The toebox in the WH4 is deeper with quite a bit more room from both a lateral and superior standpoint. And the KG4? The WH4 is too heavy for my taste and running. Thank you Tom for the great review!!! Spot on with the updates! I wore the new Kiger 4s at the Tarawera 100K. The updates are fantastic. It’s got more of a snug performance fit of the upper (while still retaining the nice wide toebox), feels slightly more cushioned/protective in the forefoot, and I feel like I get better grip in the forefoot. I actually wore a 1/2 size too big for racing, which feels grippier to me than my true size (larger lugs where I push off vs the smaller size?). I really like how the shoes torque going up and down technical terrain. I took my Kiger 3s out to Tarawera as well– after a test run on the technical terrain the Kiger 4s were the winner! I haven’t put the Wildhorse 4s to the test yet. I feel confident enough I could race any type of terrain or distance in the Kiger 4s. Sally M could offer feedback on the Wildhorse 3s vs 4s. I know she recently raced in the Kiger 4s on trail and at a road relay. Started my Kiger relationship with the 3 and wore it almost exclusively for the last 1.5yrs for runs <3hrs. Love. No problems other than delamination of "clownpuke". Was excited to try on v4. Surprised at how prominent, raised, potentially bothersome the front Zoom Air pod was under the metatarsals. A:B comparison w/my 3s seems silly given 300 miles+ on 3s, but feel very different. Haven't run in them, considering swapping for another pair. Anyone else have this feeling? Am I just forgetting what these shoes feel like prior to break-in period? I had the same feeling when I went to try on the new V4, I put it down to the fact that my old V3s are so beat up and figured I’d just worn down the cushion in that spot but good to hear someone else thought the same. It almost felt like there were 2 separate air pods under there that needed a little less air in them. I ended up holding off on the V4 figuring I could get another 150-200m out of my old 3s but still need to find some replacement for an upcoming 100k I had planned for the new 4s. Yes, I’ve had this exact feeling. Was actually searching to see if anyone else noticed it when I saw your note. But my TK3s also have300+ on them and are pretty floppy now, so hard to compare. It feels… like it could be problematic after a few hours. Not sure if I should wear them for my long run this weekend without more testing. Terra Kiger 3 for me, was a very fun shoe, but the soles get destroyed far too quickly on our rocky trails (NC). I attribute this to the rubber being separated by Eva gaps. My wildhorse 3 have a ton of miles and have been used in the same environment. They are still looking new. So far, the 4 is showing the same durability. If the terra kiger used the same sole, it’d be my primary shoe. I had the sam problem with TK3 outsole and had them replaced but not going to use them for trail running because I also think it’s a design flaw. I owned a pair of Wildhorse 3’s and they felt amazing except for one major problem. My heel, even though it felt locked down, had just enough lift that the back of my heel would rub and get major blisters. I’ve heard of one other person having this problem. Is the heelcup on the 4’s any different looking than the 3’s? I also had issues with heel blisters in the v3s. I experimented with different lacing techniques and even applied lubrication before every run, but still struggled with the blisters. I’m not sure if the cause was a looser fit in the heel cup or maybe something in the heel counter design itself (angle being too steep? coming up too high up?). The blisters seemed to get worse with more technical terrain and longer distances, so it’s probably a combination of the two. Foot variability is obviously a factor too as I know many didn’t have heel blister issues. I’m probably going to wait for a review from someone who also had heel blisters in the v3s before trying the v4s. A nike rep that I talked to online does not think that the heel cup/counter was included in the re-design of the upper. From his runs in the v4s, he said the heel cup feels unchanged from v3s. I loved the midsole/outsole combination on the v3s (and assume I would with the v4s), but still miss the overall fit (including the heel cup) from the v1s. How breathable is the upper of the Terra Kiger 4? Can you see light passing through? Does anyone wear the TK4 without socks? If so, is it comfy? I’m currently running in the NB minimus v4 and am looking for something to take me past 4 hours with a bit more comfort. I haven’t run in socks for years, so a comfy inside is a must. I can’t find these locally but can try on some of their road shoes if one has a similar upper. I ran all summer last year in the TK3s without socks and they feel great. I’m hoping the v4s are the same. Love my WH3’s – maybe 500K in them. My street running shoes were stolen when I left them out in the gym, and I’ve cycled through 5 pairs of try-out shoes for road racing and several of them have given me a symptom something like Morton’s Neuroma – but the WH give me no issues. I didn’t want to wear them out on flat road training miles, but the lost shoes and snowy winter training in Canada for a Marathon had me street running in the WH3 all winter – they fit like slippers, and have worked great, and after reading this article I am feeling like I should just ditch all my other shoes and use them for everything. My recent experience with shoes makes me want to maybe stock up on a couple of WH4 if the shoe works for me. Pleased to hear that the fundamentals of the shoe have stayed the same. I’m on my 4th pair of TK’s and I love them mostly because of how they fit. My only issue is that the last 2 pairs have torn between the upper and midsole on my right anterior side, along where the WH4 has the rubberized overlay. I’m tempted to try a pair of WH this year because of the durability but I tend to prefer a lower drop. I have the WH3 and once I get 8-10 miles into a run the comfort is gone, they just feel hard when my foot strikes. Anyone else have this issue? Would the TK be worth until a shot? My trails are not very aggressive and it is pancake flat where I live. I run the Pegasus on the road and theater are perfect. has anyone running with the WH4 experienced an issue with the fly wire on the lateral side of the shoe digging into the pinky toe? This is potentially the only issue I can see with the new WH4 versus the WH3. Nailed it on the head. Trail and Ultra running are growing and Nike definitely have the means to break into the market and make a lot of money from selling shoes and apparel but it seems that they don’t care too much about being invested in the sport which is why we saw a huge exodus from the really awesome Nike Trail team. The majority of them to Hoka…. which is definitely a brand that is jumping on this growing niche sport and make a name for itself internationally. 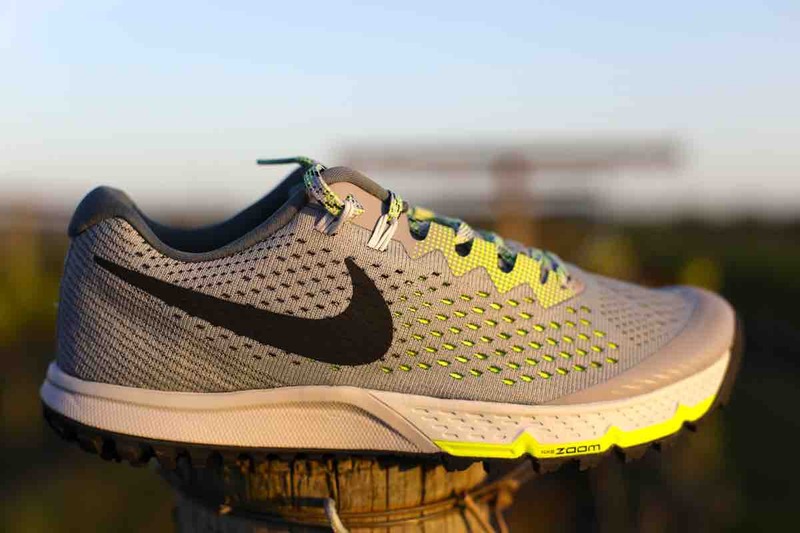 So will Nike look to acquire Hoka or another specialised trail name and run it as a separate brand? The trail community favours smaller brands dedicated to trail running and outdoor sport. Salomon (Amer sports owned) are tiny compared to Nike, but I guess they have one of the highest market shares, at least in Europe. Traditional running giants ASICS and Adidas have a very minimal presence as well. I loved the TK3 last summer and when those wore out, I got the WH to get me thru the winter while waiting for the TK4. I was anxious that too much would change and was sceptical when I read that the tongue changed and some flywire removed. Ive now got the TK4s and after one short dog run, I agree that the shoe has improved. It feels somehow less minimalist than the TK3 but firmer upper and more secure lockdown. The remaining flywires are angled back towards the heel and really lock your foot in. That, for me, was the biggest difference in fit from the 3 to the 4. Im now optimistic but I’ll have to put a few kms on them first. Uh. Bad news. After 3 long runs, the lace ‘hooks’ ( not flywire) on one shoe have torn free. Despite my early scepticism, I’d come to like the shoe a lot. Now I’ll have to return them but probably get the same again ? I had about 4 pairs of the Wildhorse 3’s and used them from everything from standing all day in a bike shop to trail running and overall the shoe fit well, but I was always hesitant to run far in them as I got a fair amount of heel slip. I bought a pair of Wildhorse 4’s and have done a few runs in them and experienced heel pain at the end of an 8 miler which I don’t experience in any of the road shoes I have done longer runs in. I do experience this same heel pain in low drop (4mm) shoes, but didn’t experience it in the La Sportiva Akasha (which has 6mm of drop). I typically use the additional eyelets on all of my shoes, but I don’t do the heel lock method, but with the fixed tongue of the new Wildhorse 4 I can’t make use of those eyelets otherwise the laces sneak behind the tongue. In other words, the tongue is a little short. Interestingly, the shoes are really water resistant, as I spend a half hour each morning with my dogs running around a park that typically soaks my shoes and socks within minutes, but the moisture doesn’t get through the Wildhorse 4’s. Thanks for your time. I love the TKs, and have am on my 4th pair. Would try the WH except I hate a drop higher than 6 mm. Just wondering why Nike cannot make a TK-ish shoe with superb mud claws/grip. Would be great for technical, muddy, woody trails like we have here in Squamish. I have very big feet (US 14) and I have to order the Zoom Terra Kiegers from the US (I live in Sweden where they are not available in that size). I own 2 pairs of Nike Zoom Terra Kieger 2 that I really like. Does any one know if the version 3 and 4 have changed with regards to sizing? I bough the WH 4s at my local running shop and wore them around the house for a day. I notice bilateral protuberances on the collar, just above the lace-lock holes. The little nubs are on both sides of the shoe, on both feet. The nubs aren’t big, but I could see them peak through the color fabric a bit. I took the shoes back and asked to feel a couple other pairs: all had the same little nubs in the collar. I have not run in the WH 4s, so whether these nubs would have been an issue is unknown. I hold onto trail shoes a while, so I can’t take any chances, especially in the collar. Damn shame: the Wildhorse seemed a good shoe for me. After wearing my new WH 4s around the house for a few days, I took them for their first trail run today. 5km into the run I was bleeding from just below both lateral malleoli as a result of these stupid protuberances. Their impact was increased by downhill running, so didn’t notice them earlier as the first part of the run was relatively flat. I can’t imagine what the purpose for these protuberances is. I cannot find anything like them on any other pair of shoes I own. Like you Jack, I also thought that it would be a good shoe for me, especially for longer distances. I have a pair of Kiger 2s that I love. The Wildhorse 3 was da bomb. I have almost 500 miles in my first pair, and even after a wet Central European fall, winter, and spring they look practically new. The upper proved to be indestructible. They are getting a bit flabby in the forefoot midsole, but that is to be expected after many miles. There is still a fair amount of tread left, even on the forefoot. That said, I have no idea why they added that ugly midfoot thing to a basically perfect shoe. I had my terra kiger 4s for less than a month and the soles on both shoes are ripping off. The shoe felt great and I was selling them hard to my runpack. “I swear Nike finnaly figured out trail running”. Idiot! At a BBQ yesterday I had to eat my words. Nike I’m sure will offer a refund so it was a safe investment and a good laugh. Nice try Nike. I’m really liking my TK4’s. I was thinking of making an additional lace hole to snug down the heel even more. Does anyone think this will work or is the tongue too short? I just ran Grindstone 100 in my TK3s. I was a little worried about grip, because I think the outsole is actually horrible on the TK – no grip at all on wet rock, which is pretty much essential here on East Coast USA trails!!! The TK3s did really well over 100 miles of mostly completely dry rocky terrain. The outsole started to fall apart after 50 miles, and a volunteer had to cut off a section of it so I could finish the race without stumbling. I will be looking at the TK4s though. The Terra Kiger is just the most comfortable trail shoe I’ve worn. No foot problems at all in my race. The soles on the TK4s peel off too (if that’s the issue had with the TK3s). Mine peeled so bad (<50 miles) that Nike helped replace them but I can already see the sole starting to peel off the replacements after the third or fourth run. For the first time in years, I put a pair of Nike’s to the test today on the WS Trail. Wildhorse 4. Agree with all the kudos in the writeup. Only change I would suggest to Nike to have a world class rocking trail shoe is to get much more aggressive with the sole tread. A Vibram type grip or much more aggressiveness like Salomon uses or the Scott RC would make it great for some of the world Skyrunning races like Tromsø, Glen Coe, or Kima. That’s a tough call, but I’ll give you some ideas. It has Zoom air in the forefoot just like the Terra Kiger 4. For daily training I’d go with the Saucony Ride 10. Thanks Tom 4 your time and suggestions. great review and info, would you say this shoes are also suitable for travel/city walking 10 miles/day ? How long have folks found it takes for break in?